N.R Narayana Murthy, chairman of Infosys Technologies one of the biggest IT empire in India, was born on August 20, 1946 in Karnataka. Murthy obtained his Bachelor of Electrical Engineering (B.E.) from University of Mysore in 1967 and his Master of Technology (M.Tech.) from Indian Institute of Technology (IIT), Kanpur in 1969. 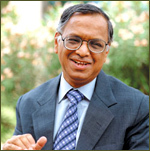 In the early seventies, Narayana Murthy took up employment with SESA in Paris. He worked with a team to design a real time operating system for handling air cargo for Charles de Gaulle airport. He came back to India after 3 years and took up a job with Patni Computer Systems in Pune. In 1981, Murthy founded Infosys Technologies along with six software professionals which later became one of the leading software company. In March 1999, Infosys became the first India-registered company to be listed on an American stock exchange. Personally, Murthy is known for his simplicity and helping mentality. He founded the Infosys Foundation, a social welfare trust for helping the needy. He has a liking for Western Classical music and has liberal ideas. Murthy's ability to put forth his viewpoints and all his other qualities make him a unique personality. Murthy holds several coveted positions. He was the President of National Association of Software and Service Companies (NASSCOM) from 1992 to 1994. He is a member of the National Information Technology Task Force of India, the Prime Minister's Council on Trade and Industry, Asia Society's International Council and Board of Councilors of the University of Southern California School of Engineering. He is a Director on the board of the Reserve Bank of India (RBI) and is also on the Wharton Business School's Asian Executive Board. Murthy was honoured by 'JRD Tata Corporation Leadership Award' in 1996-97, 'Alumni Award' in 1998, 'The ET Businessperson of the Year Award' in 2000-2001 and 'The Max Schmidheiny Award' in 2001. He was chosen as the Business India's 'Businessman of the Year 1999', the Indian corporate world's most coveted award. The credit goes to Mr. Murthy for making India one of the known names in the IT world.